My overall reaction – okay. I loved The Glass Spare (the first in this duology) but this installment felt a bit detached from the first in terms of pacing, character arcs, and plot. To recap, The Glass Spare followed Wil, the spare heir and princess to the northern kingdom. She develops the power to turn things to gemstone. She she get banished by her father and meets up with the banished prince of the southern kingdom. They become friends (a little more) and he doesn’t know she’s really his enemy. It’s good. I enjoyed it. But this one didn’t carry over that same feeling. The twists and turns of the first book kept me reading. The Cursed Sea dragged in places; romance held more focus (a little too much); and the ending took too long and felt lackluster. I read this one with the same fever. This book is highly readable. The writing is great. The story is okay. I recommend this duology to anyone who likes fantasy with a bit of romance. I know I said the fantasy was too much in this one, but that’s because there’s a handful of chapters in the middle-ish where it’s just them on the boat. Took forever. The first book just had more action and character. 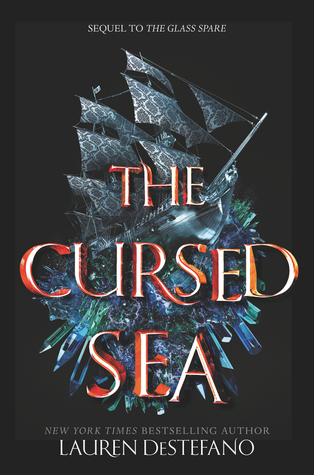 The Glass Spare had more emotional impact; The Cursed Sea never took that same leap of hitting me in the feels. And I feel – personal opinion incoming – that these two books could have been combined into one really good standalone. It would have been longer, but I think the story would have been better. So, overall The Cursed Sea gets a 4 out of 5. While highly readable and quick-paced, this sequel didn’t live up to the height set by the first book. It lacked the emotion punches, relied too heavily on the romance, and ended very similar to how I thought it would.